Radical gratitude is a concept and a philosophy that has the power to revolutionize your life. Although it can be harder for someone who is depressed to implement this in comparison to someone who is not, the potential for positive change is greater for the depressed. Thus, the reward is also greater for the one who is suffering. When first introduced to the principle of radical gratitude, some of those who are struggling will be provoked. How can my life be improved by such banal techniques, you may ask. Radical gratitude does not mean naïvely believing that all you need to do is to think positively. Rather, it’s about a long-term change of some core habits, where you gradually focus more attention on the things that are good, no matter how bad the rest is. A key part of being depressed is to put too much emphasis on what’s painful and negative in your life. Believe me, I know how this works, my journals from my worst years of depression are filled with self-pity and complaints about the world. You look at yourself and believe that you are less attractive than others. When looking at your own life you only see trouble and pain. When viewing the world you see it as an evil place filled with murder, violence, poverty and disease. Depression leads to this, by employing a mental and emotional filter that prevents you from seeing the whole picture, prevents you from seeing what’s good. With the ability to take a balanced view of the world and yourself, you feel much better. Thus, an important part of the cure for depression is to become more objective in how you see yourself and your surroundings. Radical gratitude will provide you with some effective techniques to achieve this. The aim of, and the core of radical appreciation is to hold onto what is good in life; No matter how much pain and suffering there is at the same time. This can be difficult at first. Because this is about changing habits, it’s the beginning that is toughest. Eventually this will become easier and it will come naturally. You can use a gratitude journal as a technique to get started. When you use a gratitude journal, each evening you simply write down three things for which you are grateful. These may be small things; the sun was shining today, or bigger things such as being grateful for the love you feel toward someone important to you. Just write down three such things every night or several times a week. It’s really that simple. If you are unable to write in your gratitude journal one evening, no worries, you simply do it tomorrow. Also, don’t worry about repeating what you write. With time, as this becomes a habit, you will be writing down hundreds of things, and you will inevitably jot down the same thing several times. This will serve the double service of reminding you what’s really important. When Martin Seligman and his colleagues at the University of Pennsylvania were researching the effects of this technique, they expected the patients with mild to moderate depression to receive the greatest benefit. They were astounded when they saw that it was actually the patients with the deepest depression who reported the greatest effect. To me, this is an extremely positive research result. It shows that Positive Psychology, a relatively new direction in psychology, also has something effective to offer the sickest. 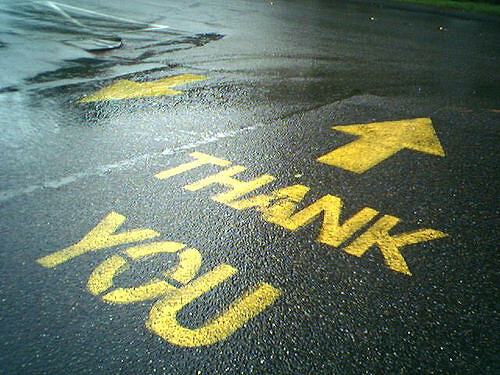 I have gradually developed a habit where I say an inner thank you every time something good happens in my life. This can be for extremely small things such as seeing someone laughing on the street. My attitude is that there is nothing in life that is too little to be grateful for. This is an effective strategy when looking for things to be grateful for and you struggle to find any. You can literally look for things to appreciate. And you can combine this with another habit that is very positive when you struggle with depression – namely walking. Those who struggle with depression may benefit from taking a walk every day, even if it is only a short walk. A five minute walk is infinitely much better than no walk at all. Go for walks every day, even when it’s raining or snowing. When you go, look for things in your surroundings that you have not seen before. Do this especially when you go for a walk in a city, it’s amazing what you will see that you’ve never noticed before. A good idea is to look up because we rarely do that. When you go looking for things that you haven’t seen before and you see something that is fun, exciting or beautiful, be grateful for it and say an inner thank you. I know, it’s a small thing, but remember – there’s nothing too little to be grateful for. If you have little to be grateful for in your life, start small. Those who are familiar with the concept mindfulness will see that walking this way is practicing mindfulness, which in itself is positive and effective for depressed people. Do this every day, and combine it with an inner thank you every time something good happens. It does not matter if you miss a day or two, just continue the following day. In addition to saying an inner thank you every time something good happens, it makes sense to say thank you every time someone helps you. Say “thank you for the ride” when you get off the bus. Say thanks to the clerk at the grocery store. Put a smile on your face when you say it. Tell your friends and family that you are happy they are in your life. Dare to be grateful even if you don’t feel it (yet). This can be an important first step out of depression. If you have to pretend to be grateful at first, it will gradually feel more and more genuine. All that is required is that you do these three things over time: write down what you are grateful for, say an inner thanks when something positive happens and say thank you to people around you. It does not matter if you are not consistent, what is important is that you increasingly phase this new habit into your life, over time. You can give yourself small reminders to follow the program. Buy a pack of small stickers; stars for example. Put these in places you see often – on your mobile, on the computer screen, on the entrance door, on the dashboard of your car. Every time you see the star you will be reminded to be grateful. By doing this over time – I can all but guarantee that you will feel better.